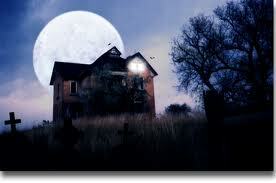 Since Halloween is just around the corner, and I love to read mysteries, I have a story and a tarot reading to tell. My husband and I were planning a trip which would combine a class reunion and visit with a relative. A few days before we were scheduled to leave, I received a call on my cell phone. When I answered, no one was on the line. “Hello, hello, is anybody there?” I didn’t recognize the phone number but did note it had the area code of our planned destination. I handed the phone over to my husband and he recognized the number right away. He said the phone number belonged to the relative we were going to visit. She lived in her house for over 70 years and moved several months ago to an assisted living facility. The house was for sale and had a pending contract. Since none of his relatives had my cell number, and we thought the old house phone would have been disconnected, it was strange to receive a call from the House. We started to hum the tune from the The Twilight Zone. My husband suggested that this called for a Tarot reading. The House had called me with something to say. On a side note, we had made an earlier trip this year to visit our relative. The visit had several twists and turns, sticky situations, and a death. On this trip we were hoping to encounter smoother waters, less waves, and possibly a happy ending. As I shuffled the deck, we both concentrated on the situation. I decided to read using a three card spread to tell the story. 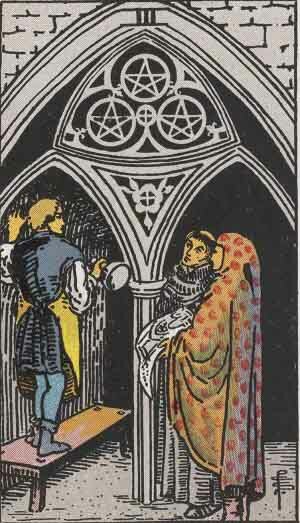 As I turned the first card over, the Three of Pentacles, my husband took a deep breath. This card showed exactly what was happening at the House. 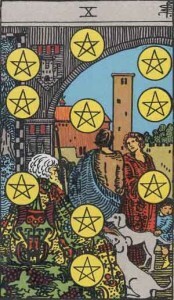 The Three of Pentacles shows an alcove with a pillar where three people are looking at working being done. The House in this reading was under contract but there was a lally column that needed repair before the sale could go through. Just the other day my husband received a correspondence that the buyer, inspector, and realtor were over at the House looking at what needed shoring up. 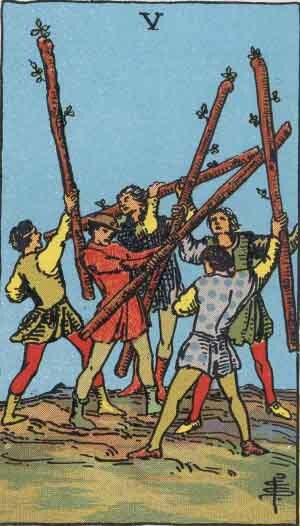 This card can often speak about a job underway, cooperation, getting the job done, a craftsman. Yes, a craftsman will be needed here. 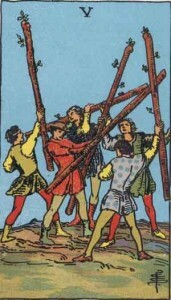 I turned the second card over, the Five of Wands, which shows five boys sparring with their respective wands. This card can often represent drama, disagreement, being at odds with each other. That summed up what was going on with the House between the buyer and the seller’s rep. There were a few lively debates, but so far no blood. Ok, now this reading was proving interesting and no deaths in the picture. When I turned the third card over for the Outcome, we both smiled. The Ten of Pentacles. This card shows a family, a man, woman, elderly relative and two white dogs in a happy situation. It can often speak of family, good fortune, tradition, and emotional fulfillment. There we were are with our relative and our two white dogs, June and Kayla enjoying our visit! We departed on our journey with a feeling of relief and hope that things would work out. And yes, we had a wonderful class reunion with several happy visits with our relative. It has been over a month since we made the trip and not heard anything more on the of the sale of the House. But, if we receive another call, the House maybe requesting a new reading. 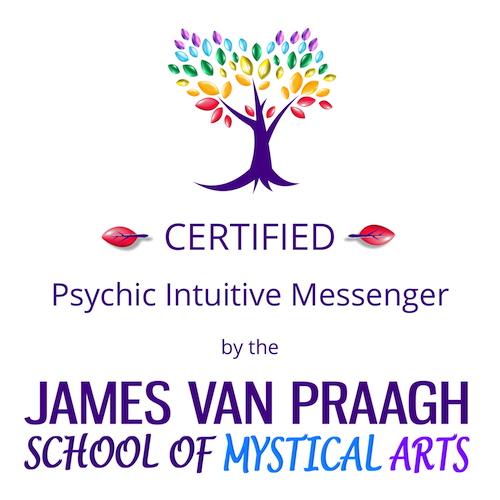 So stay tuned to this blog for any further updates (if you dare). 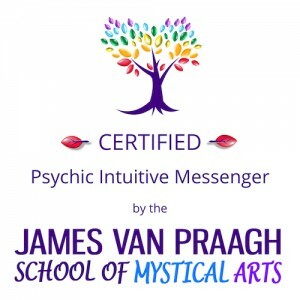 This entry was posted in Tarot and tagged Five of Wands, Halloween, mysteries, Spirit of a House, Tarot, tarot reading, Ten of Pentacles, Three of Pentacles, Twilight Zone. Bookmark the permalink.